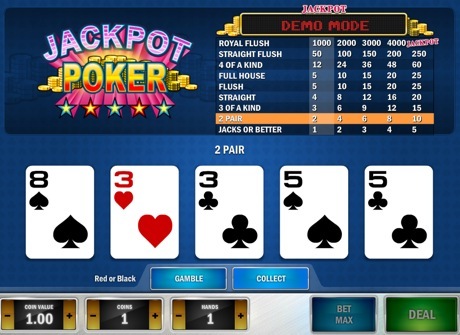 Casino Stud Poker is 5-coin progressive video poker game from Play N' Go. The coin size is fixed at $1 and you must bet max 5 coins to qualify for the progressive jackpot and get the best odds. The rules of this traditional casino game are simple - the game is played with 1 deck, cards are re-shuffled after each round. First you place your bet, then you are dealt 5 cards face-up. There are 9 paying poker card combinations (poker hands) - from a pair of Jacks or Better to the Royal Flush. Royal Flush wins the entire Casino Poker jackpot accumulated from the players in all the participating Play N' Go's online casinos. This is a very exciting poker game where you play one-on-one against the casino. With a skill and relatively large progressive pot you have a lot of chances to win and win really big, providing you bet max 5 coins to qualify for the Jackpot - just hit a Royal Flush to win the Progressive Jackpot! After placing your bet, you receive 5 initial cards. Click on the cards you wish to hold. Cards that are not held will be discarded and replaced by new cards when you press DEAL. The rank of your final 5-card hand determines your payout. You have the option of trying to multiply your prize by playing the gamble bonus round up to 5 times in succession and up to a limit of 1,000 coins. Beat the Dealer: The dealer's card is dealt face up. Select one of the four face-down cards by clicking on it. If your card ranks higher than the dealer's, you double your prize. If it ranks lower than the dealer's, you lose your prize. If the cards are of the same rank, your prize remains the same. High or Low: Your objective is to correctly guess whether the face-down card is higher or lower than 8 by clicking on the appropriate button. If the face-down card is 8, the game is a push and your prize remains the same. Red or Black: Your objective is to correctly guess the colour or suit of the face-down card. If you guess the colour correctly, you double your prize. If you guess the suit correctly, you quadruple your prize. The RTP based on best strategy is 91.30%. The RTP based on best strategy is 95.30% at max bet (5x $1-coins).